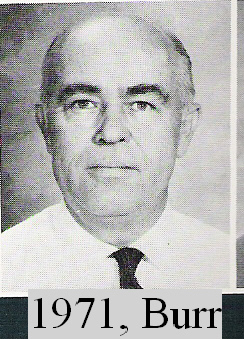 In Fall 1969, Ted Ryan, WB6JXY arrived at John Burroughs Jr. High School (JB) to teach electric shop. By summer 1970, he held the first Novice licensing class at JB. This page has photos from the start of JB's ham program. [1970 and 1971 Burrs courtesy of Murray Maidan, WN6LNZ]. We honor Bill Harris, WA6KSU(? 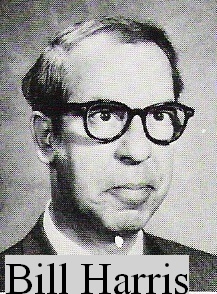 ), who was initially Ted's co-teacher. Below, the founding members of the John Burroughs Jr. High School Amateur Radio Club, 1971. Top Row: Michael Kirkwood; (Jeff Kasmer or Leonard Fenton? ); (unknown); Alan Schneider, WA6DQA; Jon Ceretto; (unknown); Ken Guvik, WN6PQJ. Seond Row: Carole Danielson, WN6DQK; Jane "Bambi " Mason, WN6DQL; Kasceil Ginsburg (callsign unknown, sk); Dan Waxer, MD, WB6HBC; (unknown); Bert Mitchell; Noel Innis. Third Row: (unknown); (unknown); Kenneth Oya; Tim Aronson; Michael Firsh, WB6DMI; Tony Hecht, WN6DQB. Bottom Row: Scott Bornstein; (unknown); Jesse Kramer; Lee Hilborne, MD, N6LH (orginally licensed as WN6DGH); Ted Ryan, WB6JXY, Club Advisor. Not all licensed radio amateurs at JB at the time were in this picture. Not all those in this picture are licensed radio amateurs. Acknolwedgement: Thanks to Murray Maidan, WN6LNZ and Lee Hilborn, MD, N6LH for their caption research.